Texas Freckles: Second time's a charm! Yea! It worked this time. I think my partner will like this pinnie, so I'm excited that this one turned out better. Happy hump day everyone. Sweet Mary, that is just beautiful!!! And, can I say, the pins are the perfect finishing touch. Clever clogs. Too cute! Anyone would love to have that pincushion! You did it!! I didn't offer advice yesterday,because I do the exact same thing with some of my triangle points! I'm off to the read the comments from yesterday to see what you did. It looks great! 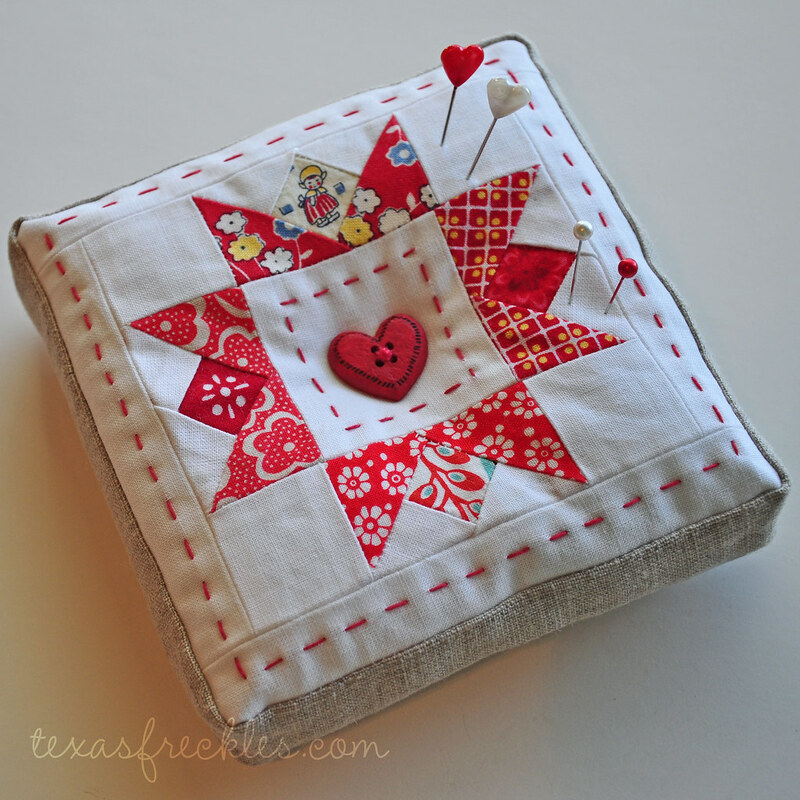 AND I love square pin cushions, so this one looks awesome! Wow, it looks great! Of course, I love the linen in the design too. The hand-stitching is adorable. So fantastic!! I have thought many times about making a pincushion and attempting handstitching on it. I don't know where to start on the handstitching though...what kind of needle, thread, stitch, etc. Do I sandwich like a quilt and then hand quilt, do I have to put it in a embroidery hoop??? Maybe one of your fabulous tutes is in order here!! Oh, that pincushion is FAB! Love it! That looks so cute! And I love the fun pins. There are NO fun pins in the whole of the UK, I'm convinced. Boo boos are just a part of the "joy of quilting". You recovered VERY nicely. I'm new to you - all those amazing hexies! Really enjoyed your video on attaching the rows. Thanks! Love your work! Simply adorable! Fantastic! Your colors are wonderful and the pins are the crowning touch. Good work! Wow that is one of the nicest pincushions I have ever seen! Perfect. Love your pincushion its really cute! Like I said in the Flickr group, I absolutely love this pincushion. You have a heck of a lucky partner!